Fighting to be Frugal: Got Milk? How About 1/2 Price? Got Milk? How About 1/2 Price? Even though this clipping from the Globe and Mail from a few weekends ago says that milk prices are actually 8% lower in the past year, our milk costs seem to continue to rise here. We currently pay between $6.63 and $7.05 for 4 litres of milk. It depends on where you purchase it at. Not many have our own source of milk in our own backyard, so we have to pay the pied piper whatever he decides to charge it. Right? There are several ways of having cheaper milk. A friend of mine barters for her milk. She has a lot of laying hens, too many to use the eggs from, so she takes her extra eggs to a neighbour that has too much milk from their cow. They trade the goods to each other. This is one thing I would love to do. However, I don't have laying hens and I don't have a neighbour with extra milk that they would like to trade something for. Another way to lower the cost of milk a bit is by using powdered skim milk. My whole face just grimaced at the thought of this. The memory from growing up drinking it and seeing the rim of blue around my bowl of cereal is all too fresh. I totally get why my parents did it, I'm just glad that it doesn't really save any money on it now. The cost of this product has jumped substantially over the x amount of years. A discussion that started over at our Facebook page, had one contributor that buys whole milk, as it's the same price as 1% or 2%, and then waters it down to 1/2 milk and 1/2 water. She states it tastes similar to 1%. I had never heard of anyone doing something like this before and was completely amazed. Since then, I heard it on Anderson Cooper's show when they talked about frugal lifestyle the other day and somewhere else. I guess my eyes were blinded about this. One other way to reduce your milk price is by supplementing. This is what we've started to do. We were going through 8-9 four litre jugs of milk a month. That's $53.04 on the low end a month. 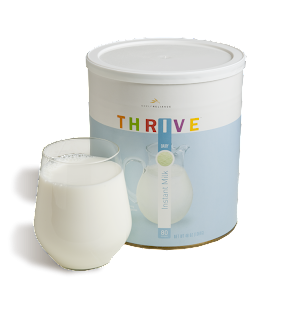 We were introduced to Thrive Instant Milk (I don't sell this, nor am I getting paid to say this. I buy it here). Alone, it's ok. It's not my cup of tea. The price is $21.69 (plus $4 shipping) for a #10 size can, that's the biggest we can get in our country, for 97 servings of milk! That equates out to, if I've done my math correctly, $4.24 with shipping for 4 litres of milk! $33.89 for my entire month of milk! However, I don't use instant milk on it's own. I use just around 1/4 gallon (1 litre) of whole milk, 1.5 litre of Thrive Instant Milk and 2.5 litre of water. My $6.63 gallon of milk is now down to $3.24. Down by 1/2! And the best thing is, my children are none the wiser! What is one item you substitute to lower your grocery bill?